Following 53 weeks of intern experience as part of the placement year of my Fashion Communication and Promotion degree, I've been able to pick up plenty of hints and tips along the way from everything related to accommodation, budgeting and travel, to the best websites to find reliable and relevant industry placements themselves. Entering into the world of interning can seem totally overwhelming at times, especially if you're thinking of moving to a new city or transitioning into an industry you've not yet been a part of, but hopefully this comprehensive guide to interning in London will reassure you that nothing is as scary as it first seems and there's plenty of tools out there, both online and offline to make the process as exciting as it should be! First things first- finding the perfect internship! My degree and career aspirations focus on the worlds of beauty and fashion meaning my advice for relevant websites is on the whole tailored to these spheres. Internships are a huge part of so many industries however so there's sure to be relevant websites for the type of internship you're seeking, or if you're a uni student then asking your lecturer or students union could definitely help point you in the right direction! Creating a profile on LinkedIn is not only great for keeping all of your industry contacts in one place, but it's also a really helpful starting point when looking for placements or jobs in general. The site has a whole section dedicated to jobs and placements that are tailored to your interests (based on your previous activity and searches on the site) as well as allowing you to follow brands and senior members of staff at your fave companies so you can ensure you're in the know when new opportunities are put live. Some brands advertise roles exclusively on LinkedIn in order to find employees that they see as professionally desirable by using the website so it's a really great place to ensure you have a profile, both for finding internships but also for future job prospects! If you're seeking a role in the fashion and beauty worlds, FashionWorkie is the site for you! Used by hundreds of brands to advertise new roles, it shares placement opportunities from the likes of ASOS, Missguided, Erdem, Grazia and pretty much every PR agency under the sun! 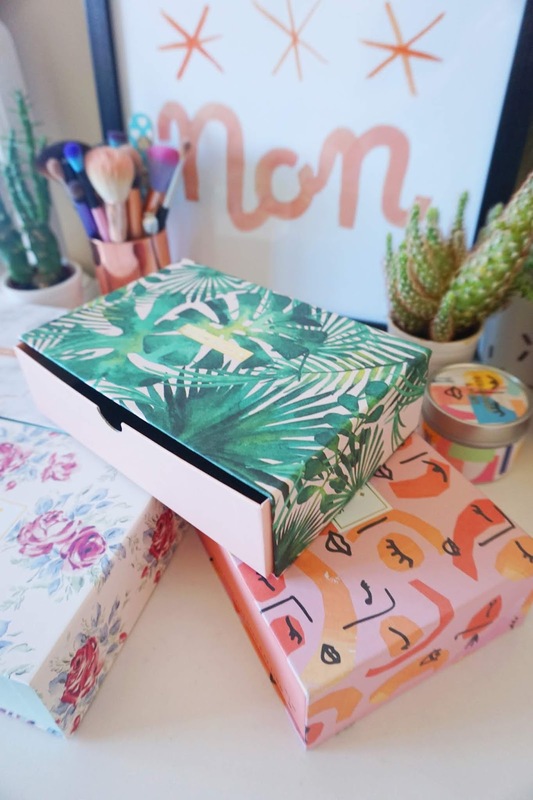 FashionWorkie is the website I used to find my internship at Birchbox so it really is a great one to keep an eye on for exciting and immersive opportunities! I'm signed up to their mailing list so receive regular updates of new jobs and internships directly to my inbox. The website usually allows you to submit a CV and cover letter to then be sent over to the brand however also sometimes sends you directly to the brands careers page to submit an application there. The website can be a little clunky in that sometimes opportunities are still live on the site despite the position having been filled (a v sad realisation I definitely experienced a few times) but on the whole I really do think it's the go-to place for all things fashion placements! Twitter and Instagram are especially good places to keep your eyes peeled for up and coming opportunities, especially if like me you're hoping to progress into the world of social media or content creation! Following your favourite brands is always a good first step as they often share new positions here first. It's also worth checking to see if they have accounts specifically dedicated to new openings- the ASOS Careers Twitter account is a good example of this! If you're particularly eagle eyed then it's always good to do a little internet stalking and follow people that work in the companies you're aspiring to be a part of, even if just to gain a little more insight into their day to day role! It's possible that because the industries of fashion and beauty are so dominated by social media that this is the norm for me, however I definitely think it may be odd to do so if start to follow Laura from PR who has a private Instagram or Gemma from marketing who only posts photos of her cat (although that is my dream account tbf). What I'm trying to say is, if these people have an existing following or share a lot of their life online, it's not a bad idea to hit that 'follow' button and keep up to date so you can be first off the mark if they happen to share that they're in need of an intern! Other great websites to bookmark include fashionunited, glassdoor and Indeed! One of the scariest parts of my placement year once I was safe in the knowledge that I had actually managed to secure an internship after finishing my second year at university was thinking about where I would be living. After a pretty terrible experience during my first and second year when it came to shared student housing, I felt pretty dubious about the idea of a large house share in London where the conditions would no doubt be even more questionable, at a likely more inflated price! After a month of staying with family friends and realising that whilst the rent was free, the experience was less than ideal, I set about fully making plans to find a place of my own. It's worth pointing out at this point though that if you do have family or friends in London that you can stay with for a short period of time it's 100% worth doing, especially if you're working an unpaid internship. I've lost count of how many times I wished my family were from London so I could continue living at home but alas my home outside of Cambridge is just a little too far for a daily commute. Make the most of contacts you have because saving money wherever possible is SO helpful for managing London living costs. My one saving grace when it came to finding affordable and more importantly LIVEABLE accommodation in London after hours of scouring the internet looking at v questionable interior photos was a website called RoomForTea. The site was recommended by my placement advisor at university after a previous student had used it whilst in London and I truly can't recommend it enough! From what I understand the site is still in its relatively early stages meaning it can sometimes be a little difficult to navigate (e.g. rooms don't say their availability on site, you have to message hosts individually and enquire about the rooms) but the website is designed JUST for interns and students on placement in London meaning hosts and guests are all on the same page. 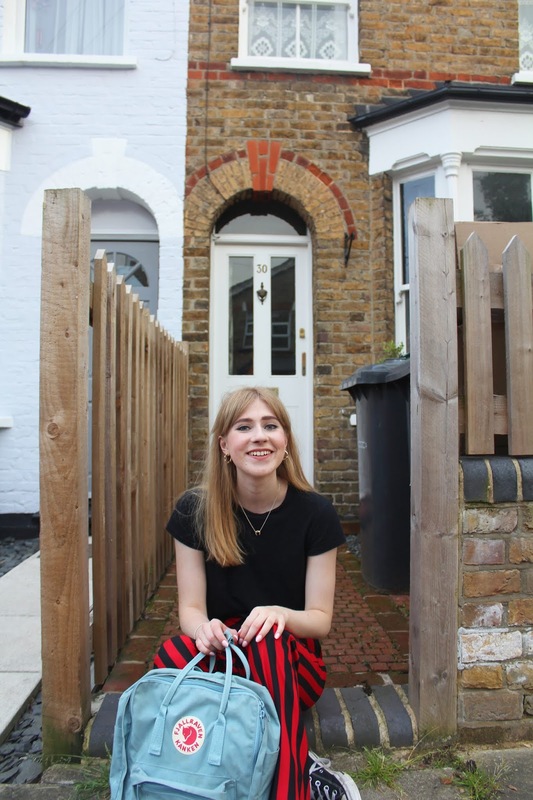 For me I definitely felt reassured being in London and living in a house that I knew other interns in my position had also lived in, and with a great choice of different properties in a range of areas across London to accommodate a variety of budgets, it felt like such a breath of fresh air! 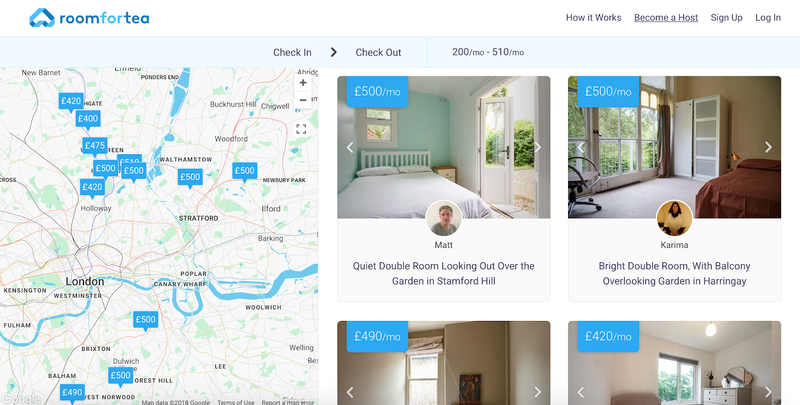 Other websites that are often used by interns in London and so are definitely worth checking out include SpareRoom, GumTree and AirBnB however when browsing I definitely found a lot of properties on these sites were on the more expensive end of the spectrum compared to what I paid for my RoomForTea property. It's all a case of taking your time to really scour through the sites because there are always hidden gems amongst the more questionable looking rooms! Facebook is another great resource to make use of as there are often Facebook groups for specific areas in London or for students in particular to rent rooms from those who have perhaps gone home for the summer or travelling for a few months and want someone to cover their rent. It's great for shorter term and more flexible stays, however there are also more permanent contracts shared too! Again it's just a case of taking the time to look and contacting as many people as possible- rooms do tend to go quickly! 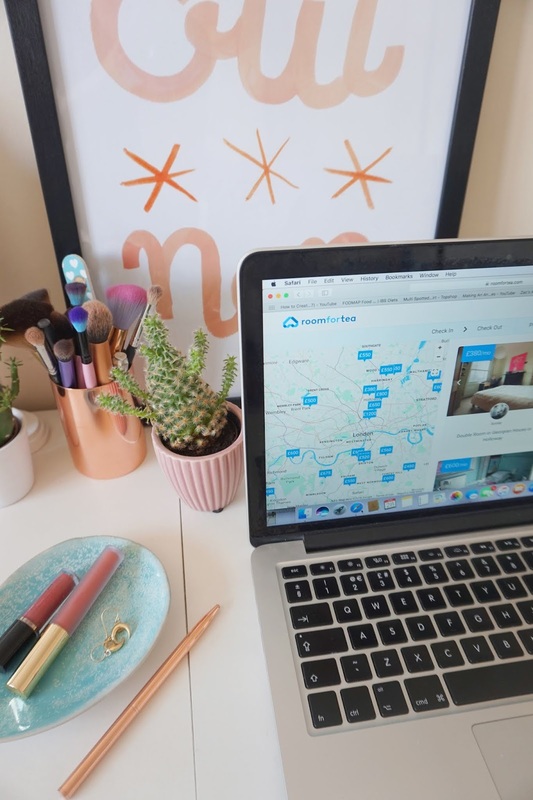 Accommodation is definitely a bit of a minefield, especially when navigating London prices and how quickly properties can be let, but hopefully the above websites will provide a good starting point for your interning experience! The horrible reality with a lot of placements, even when working for the most established and high profile companies, is that often full time internships are advertised as unpaid or 'expenses only'. I could try write a whole dissertation on the societal and class problems unpaid internships create, however to keep it brief for this blog post I want to clearly establish that I'm totally not in support of unpaid internships and having done 3 myself, still found it sits wrongly with me knowing how much work I put into my time there. ANYWAY. If you do secure an unpaid placement, be sure to ask if expenses are included as sometimes companies will cover your travel and give you £5 for lunch- not exactly life changing but definitely helps along the way if you can get yourself a Pret Macaroni Cheese to combat any feelings of bitterness! I had to resort to using my savings when working unpaid placements and therefore did lose a lot of money in my initial months in London, however was finally able to secure a paid internship after 4 months which then allowed me to add back into my dwindling bank balance! Whilst paid internships aren't easy to come by, they are out there so don't lose total hope of ever finding one! An app that I became aware of near the end of my placement year so didn't have chance to fully use to it's potential but is such an amazing idea is called Olio. Branded as a 'food sharing revolution' the app allows people to list their unwanted food (either of things they haven't got round to using or that's about to go out of date), share their location and then allow other app users to get in contact and ask to pick it up. FOR FREE. Of course the premise of the app means it requires a little bit of effort to travel to someones house and collect food, but I found there were so many users of the app in London that there's bound to be someone near to your place of work or home! Shops such a Pret also get involved too, posting their sandwiches and pastries at the end of the day if they are no longer able to sell them, however these are usually required to be collected by one main person and then are collectable from their home. As I said it takes a bit of getting used to the system but if you're living on a budget and notice someone down the road to you has a free selection of food available, it really is a no-brainer! Side note: This app would be SO perfect for helping those who are homeless and sleeping rough too, so even if you can afford food regularly but have a little spare time to collect and distribute food to those who need it then I'm sure that would make the world of difference. One of the single most confusing and expensive parts of interning in London: public transport. 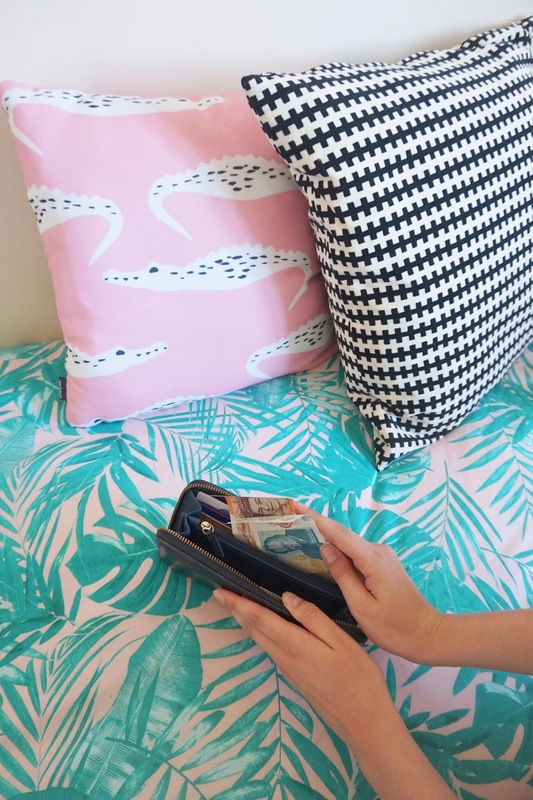 In terms of money it's very difficult to completely avoid a large portion of your budget being used on the tube, however there are plenty of ways to make the situation more manageable! I used my contactless card for tube journeys simply for the convenience of not worrying about topping it up before my commute, however have since learnt I could have made some hefty savings by linking my 16-25 RailCard (a MUST if you haven't got one already!) to an Oyster card- something I definitely wish I'd looked into more at the time! Buses are also a far cheaper way to get around in comparison to the tube with journey's costing £1.50 a time and with a daily cap of £4.50. It's also super handy because the hopper fare means you can make unlimited journeys on buses and trams for your initial £1.50 fee within the hour of first tapping in with your contactless card- perfect if you have a complicated commute or even for some sightseeing! In terms of navigating the transport system in London, it's still something that confuses me to this day! I honestly would never have been able to get from A-B however without the help of the CityMapper app which is just a MUST for anyone living in or even visiting London! You simply put in your start and end destination tube stops and it tells you exactly where to get on and in which direction, and any points you need to change along the way. It gives multiple route suggestions, including buses too if you're partial to travelling above ground and also adjusts to delays and traffic LIVE to give you an accurate indication of how long the journey will take. It also has a general maps feature that works much like AppleMaps for walking directions too! It's a literal lifesaver and I would honestly have been completely lost (literally) without it! It's also worth bearing in mind that whist London is an extremely vast place, sometimes it's just as quick to walk between destinations as it is to an underground station, touch in, get down to platform level, wait for a train and then come back out again as it is to walk! Not only did it help me get my bearings to walk in London but it also helps with your budget to avoid public transport wherever possible! 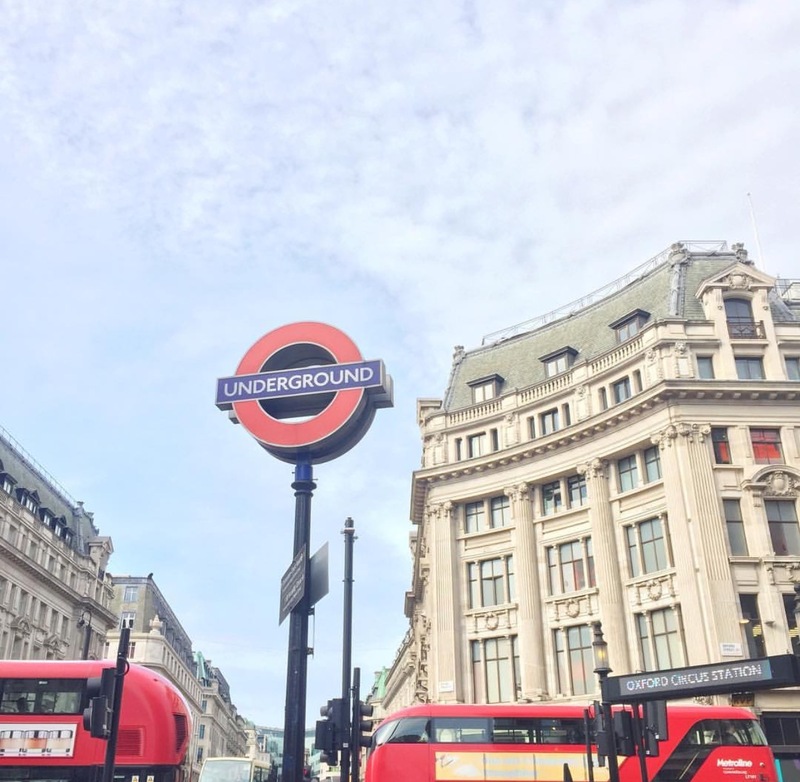 I truly hope this post has been helpful if you're considering an internship in London and has provided you with some tips and tricks that you can implement to make your life a whole lot easier whilst navigating the often crazy world of interning! I'm thinking of putting together another internship themed post with some more miscellaneous points (I'm thinking cover letter and interview advice etc!) so keep an eye out for that too! Let me know if you're an intern and have any fab tips of your own- I would love to know!